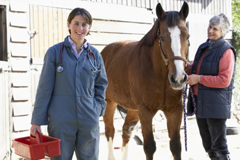 The Oregon Veterinary Medical Association's mission is the promotion of veterinary medicine as a profession, education of the public regarding veterinary medical issues, and the protection of your professional interests as a veterinarian. We hope that you will join over 1,000 of your Oregon colleagues in OVMA membership. To apply, complete the OVMA Membership Application and submit it with your dues payment. Contact us for more information. The official newsletter/publication of the OVMA, available by mail or e-mail. At least bimonthly by email, with breaking news alerts. Receive instant notification of e-News or e-News alerts on your phone or tablet. Members searchable by city, clinic or special interest. Find a Vet is the most visited part of our Web site. Only members are listed. Find a Vet is the most visited part of our Web site. Our award-winning resource guide in PDF format. Hard copy available for $50. Archive of Oregon Veterinary Conference notes back to 2010. Members receive a $100+ discount per ad. Newsletter archive, practice tips, legislative updates, etc. Recent graduates (2017/2018): First year free! First time members (who are not recent graduates) start at this step.